Wild herb salad with flowers, hay-baked beef fillet, scallop sashimi with seaweed vinaigrette – time and again star-studded restaurants and foodie magazines offer us recipes that take us on a culinary trip back to nature. Is airline catering embracing this trend? Back in the days when I was training as a cook, we had to obey the strict rules of French cuisine for presenting food. Starches to the left, vegetables to the right, meat or fish in the center and around it the sauce. Did you know that this is the reason why the fork is placed to the left, next to the starches? In the past few years, both the rules of presentation and their object have changed completely. The 90s saw the rise of molecular gastronomy. In simple terms, the produce is broken down and then put together again using elaborate techniques. This enables you to change the appearance and texture of the produce while retaining its taste. Complex molecular gastronomy, with its tricks and gimmicks, was then followed by the Nordic Purism trend. It allows the produce to take center stage but leaves it in its natural state. The natural food trend is part of the modern lifestyle, which has also found its way into cooking. We know about edible flowers and hay-baked beef fillet, but have you ever tried moss or tree bark? In many a restaurant guests can sometimes no longer exactly tell what is intended for consumption and what is intended as a decoration. But one thing is certain: food is becoming a natural and increasingly visual experience – sometimes even with sound. Can these developments be translated into airline catering? Of course, our airline catering is subject to certain restrictions, which we must observe, regarding food safety, storage space in the trolleys and on board, as well as inflight service. Hence, it is not true that anything is possible. But like in a star-winning restaurant, our aim is to use high-quality produce, especially in the premium classes, and tell a story with our dishes. 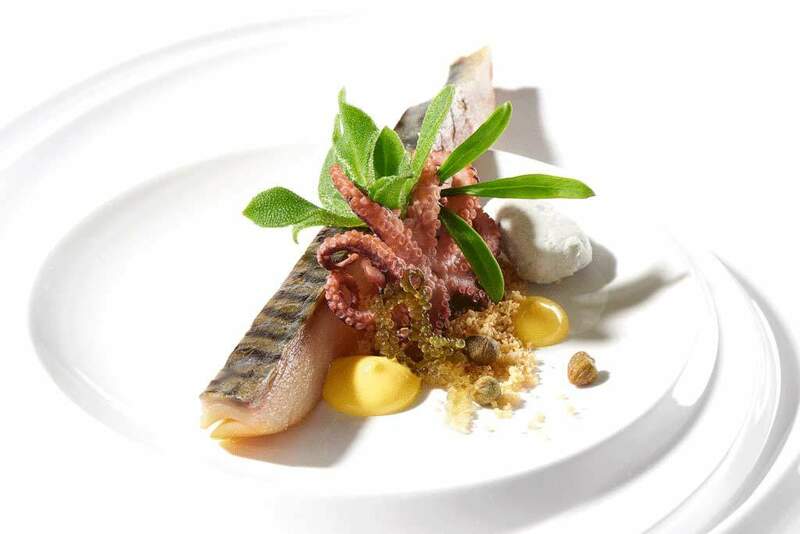 Take, for example, the “walk in the dunes” that we served guests at our booth at the World Travel Catering & Onboard Services Expo (WTCE) last April and which could in a similar way also be served to passengers on a plane: A cold-smoked mackerel fillet with a special sea fennel served on a sandy base with pebbles. Food presentation is a very high-tech affair nowadays and plays a major role alongside the quality of the dishes and their story. In classic French cuisine the plating rules are clear. But we also allocate a dedicated place to each component on the plate. This is not just for mere effect because, appearance aside, the taste of the food is still the decisive factor. And the packaging of a dish also plays a significant role … pea cappuccino from a cup, sandwich spread from a tube and salad dressing from a pipette. Anything goes! Today eating is an experience that engages all the senses. And thanks to the natural food trend, it is increasingly becoming a culinary tour of edible landscapes. 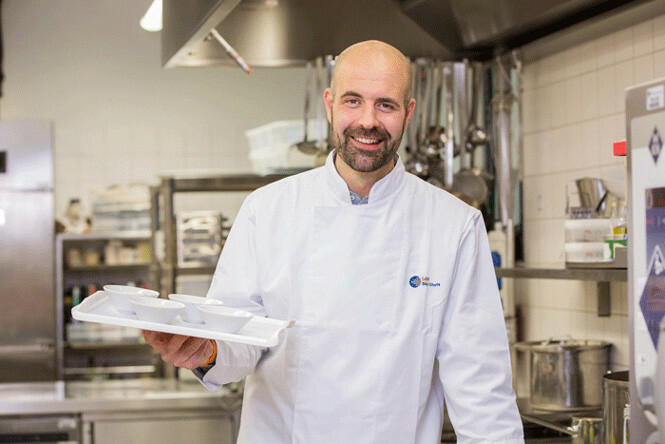 Volker Eisenmann was appointed Executive Chef Culinary Excellence Lufthansa at LSG Sky Chefs in 2016. He has had a rather impressive gastronomic career. In October 2003, he joined Feinkost Käfer as a sous chef. Over the years, he was given more and more responsibilities. Starting in 2012, he was put in charge of product development and quality management for the Käfer Group. Later, he also became head chef of their original restaurant in Munich, which now boasts 15 Gault Millau points. Before working for the Käfer Group, Volker had held various senior positions in a number of fine restaurants, including star-winning establishments in Wertheim, Nuremberg and Bergisch Gladbach, Germany.